"Pacerpoles remain miles ahead of the competition"
Chris Townsend: Pacerpoles: My conversion to poles came through ski touring. After a few years it dawned on me that I didn't need to be on skis for poles to be useful and I started using them when walking. There didn't seem to be much difference between various brands until I discovered Pacerpoles with their specially shaped handles. These felt natural and comfortable to hold and I liked not having to use straps. I also found them easier to use and more efficient. Eventually I came full circle and started using them for ski touring, where I discovered they were better than standard ski poles. John Manning: Pacerpoles: Well, regular readers will no doubt be tiring of my constant references to these but it's worth mentioning that I switch between lightweight carbon fibre models for day walks and hardier alloy originals for backpacking. 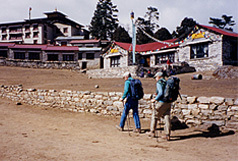 In terms in reducing stress on the knees, aiding balance on river crossings and such, Pacerpoles do everything that lesser walking poles do. For me though, the unique left and right moulded handles turn them into powerful propulsion units that enable me to hike further and faster. Dan Bailey: Pacerpoles: Having mentioned poles I ought to elaborate. My fellow reviewers have already sung their praises, so at the risk of turning this into a love-in I'll just say that once I'd tried Pacerpoles there was no going back. They're not the lightest poles tested. They don't have clips for easy adjustments. There's no shock absorber to minimise impacts and they don't even have padded straps. So why do Pacerpoles come out on top? Because their innovative angled handles make them the most effective trekking poles on the market. If you've used conventional poles before, it might take a while to become accustomed to Pacerpoles. Like others, they're great for absorbing knee-crunching impacts during descents, for correcting pack laden posture, and for helping balance during river crossings. Where they differ is in their handles, which are shaped for each hand. Your thumbs rest on ledges that contour beneath your hands and, as you place the poles with each stride, your palms push down on the ledges, effectively thrusting your body forward, making much more efficient use of your energy. You can either walk faster and further, or simply arrive at your destination less fatigued. Pacerpoles don't have straps because they don't need them: the angle and the shape of the handles conform to your hands' natural resting posture, so you grip them with very little effort and no wrist bending. The heavy plastic handles can get sweaty but they're so much more comfortable than upright handles that you'll barely notice. Pacerpoles have been my favourite trekking poles for several years now due to the angled handles which are shaped for the left and right hands. These handles don't require straps, though there are thin loops of cord for security when dropping a pole could mean losing it. The angle and the shape mean its easier to push down on the poles and get maximum leverage for the least effort - and as they can be held quite lightly, your hands don't get tired. Compare this to any other pole and it is noticeable how much more energy-efficient the Pacerpole design is.............. I found the Pacerpoles felt more natural and less tiring in both ascent, and descent over rough ground and tracks. I also felt that they allowed greater precision when placing the points. I've used Pacerpoles more than any other in recent years. They're the most effective, they increase efficiency by enabling your arms to help propel you along and they take some of the weight and stress off your legs. It's down to the handles. Uniquely, they're shaped for left and right hands and angled so the wrist does not have to be cocked, giving maximum leverage with least effort. The handles don't need to be gripped tightly and there are no straps, just thin cord loops to slip over your wrists so you don't drop the poles if you let go; I only use them if dropping a pole might mean losing it. The pole shafts are conventional with standard twist internal adjusters and neoprene sleeves on the upper shafts for comfort when holding them below the handle. Pacerpoles are weighty as the handles are thick and solid that doesn't effect swing or make the poles tiring to use. Indeed, I find them less tiring than standard designs." "….Angled handles are slightly more comfortable to use than uprights though the only poles on which the handle makes a real difference are Pacerpoles…." "….I've given the Best Buy rating to the heaviest poles for good reasons; they perform best and, in use, I can't tell the difference in weights. I've been out with a light pole in one hand and a heavy one in the other and not felt any difference. Weight doesn't matter as long as the poles are used; only if they're going to spend time on your pack does weight become important." "….Pacerpoles are by far the most efficient and worth the high price if you use poles regularly and want to get the most out of them…." "I often wondered on the winter challenge how on earth I managed the Summer Munro round without Pacerpoles. It isn't the statistics of weight taken off your knees per mile that impresses me about them. It's the speed you can move and the distance you can cover with them. Adorned with snow baskets, the poles worked just as well in the winter and were great for some four-season boot skiing (without skis). They also worked well climbing on gentle slopes with the crampons." Tackling 2700 miles through a landscape that can throw anything at you requires special gear. John Manning outlines a few of his favourites from his 2004 Pacific Crest Trail thru’ hike. I’ve been sold on knee-saving Pacerpoles for some years now and wouldn’t have hiked without them. The angled, carefully moulded handles help your arms to propel you forward; without them, I could never have covered some of the bigger daily mileages that I did – I wore out two sets of pole tips and baskets during the hike. Well-known outdoors folk who have tried Pacerpoles and cast aside earlier allegiances include Chis Bonington, Colin Mortlock, Don Roscoe and even Cameron McNeish. These aren’t people who are easily swayed, yet all swear by the advantages of Pacerpoles over more conventional poles. John Jackson, former director of Plas y Brenin and a member of the team that made the first ascent of Kangchenjunga in 1955, said he wishes they’d been invented years ago. Ray Goldring, of New Zealand’s Mountain Safety Organisation, was bowled over by the difference Pacerpoles made over regular ski-type trekking poles. 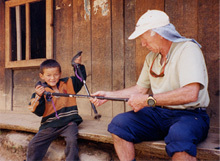 Perhaps one of the strongest conversions is that of retired mountain guide Don Roscoe, the innovator who designed mountain rescue’s Roscoe stretcher, who has said: “it was immediately apparent that the handle design was in a totally different class to any other trekking pole ….. Pacerpole handle design is a most significant step forward. We really do need to get the message across as strongly as possible”….. The phrase Heather returns to again and again is ‘functional anatomy’. The Pacerpole’s unique left and right handles are the result of examining not what poles do, but what the body needs from poles in order for it to maximise performance. Author and outdoor education expert Colin Mortlock …. believes those left and right handle are the biggest advance since the invention of hiking boots, making other pole handles obsolete ….. “you have maximum control and, for the first time, you have the potential to efficiently use your upper body in the movement of walking”. Extract from pages 85 - 86. ...This design is taken to radical extremes in British-made-Pacerpoles, which have molded thermoplastic-rubber grips, acutely angled, that are shaped for each hand. These enable you to transmit far more power through the poles, since the angle is “calculated for optimum range of arm leverage”. The grips are very comfortable, and the poles are a leap forward in design. They are the ones I use most now; they really do give me more power and take more weight off my legs than standard poles, especially on long climbs. They have only a short piece of cord as a security loop rather than a proper strap, which isn’t needed – you hold the poles loosely in your hands rather than letting the loops take the weight. The poles come in three sections with an internal locking mechanism. There is a soft neoprene sleeve on the upper section, and Pacerpoles is developing a camera mount that will fit on the grip. A pair of Pacerpoles weighs 23 ounces. For more information, see pacerpole.com.